“Let’s go to Labuan Cermin, sometime in the near future,” Indah asked me couple months ago, maybe by the end of last year. Labuan Cermin is more popular than Biduk-biduk, the district where it belongs to. The uber blue water lake with a boat floating (or I can say it seems like flying) always appeared in every Labuan Cermin photographs I saw. But not so many people know about Biduk-biduk. Of course, before we finally arrived to Labuan Cermin, I did some browsing to find out some interesting things around the lake. Is there anything around Labuan Cermin I can visit and see besides Derawan or Maratua island? 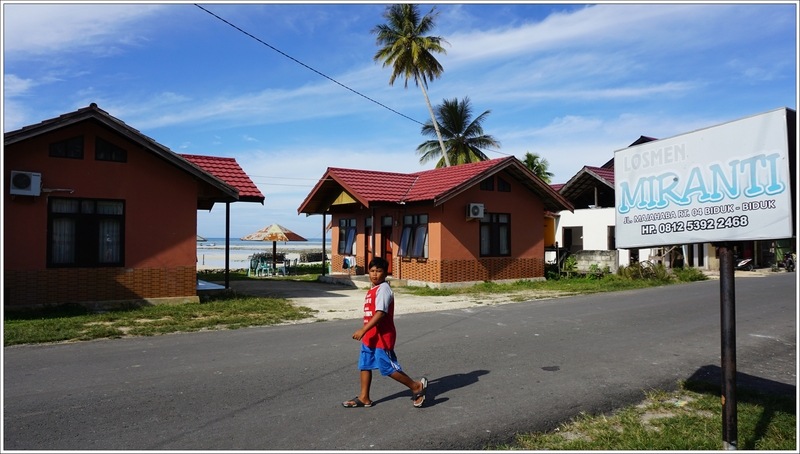 Long story short, we finally arrived to our lodge at Biduk-biduk, a small village at Biduk-biduk sub-district in Berau regency, East Kalimantan, after the six-hour road trip from Tanjung Redeb, Berau. Not a fancy one, but the best accommodation we can get at the village, regarding the coastal view next to our room. The night trip from Berau to Biduk-biduk did not make me realize how simply beautiful the village is. All I know was I am at the east-most side of East Kalimantan. 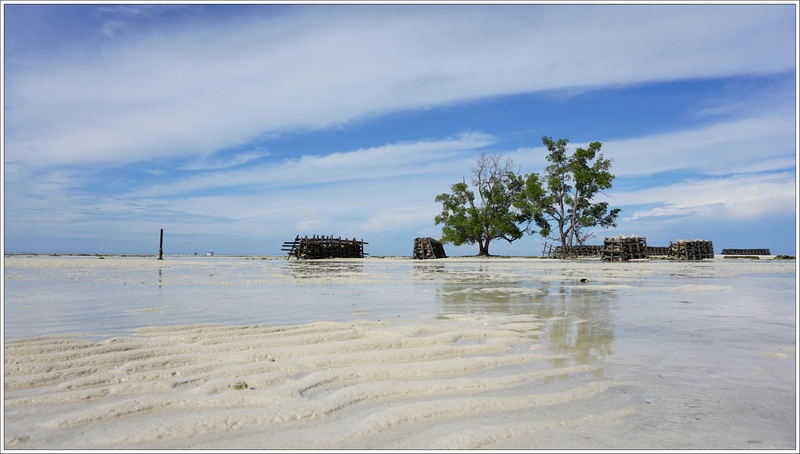 Biduk-biduk beach during the low tide. The next morning, after having Yellow Rice (Nasi Kuning) for breakfast, I got my door knocked by someone outside. “Do you want to join us visiting the islands? Only Rp. 500,000 for five locations for both of you. Because you will join my boat that rented by the family from that room,” a guy appeared offering his service to take us enjoy Biduk-biduk’s sea. I finally knew his name is Edi right before he took us with his boat. That morning, I realized Biduk-biduk is a village with countless beautiful coconut trees as its main panoramic view as well as its beach. Coconut trees everywhere. That’s Biduk-biduk! Situated almost at the east-most side of East Kalimantan, Biduk-biduk offers not only pristine coastal view, but also the islands around, underwater ecosystem, waterfalls and the famous meromictic lake Labuan Cermin. Our trip that day began from Teluk Sulaiman port, located 15 minutes driving from Biduk-biduk village. Segending river was a part of our route to the sea after leaving Teluk Sulaiman. As segending river is a downstream area, you can also see it as a shallow sea. Before we reach the sea, we saw dozens of fishes and sea turtles along Segending area. The tosca green water sometimes covered the appearance of sea turtles, besides they moved quiet fast (or our boat did) so we only saw each of them not even for a minute. Actually Lamin Guntur is an eco lodge in Teluk Sumbang. Asides with the lodge, here you can find a small bat cave. You may get lucky if you see some bats hanging inside or flying around the cave. Teluk Sumbang is an area where the indigenous Dayak tribe live in Berau area. On my recent trip to Biduk-biduk, I did not make a visit to the Dayak village. But I visited Penimbul waterfall, one of the three waterfalls at Teluk Sumbang. Penimbul waterfall is the smallest waterfall from those three. It is the closest and the easiest one to reach from the beach. We went swimming at the pond for a while. All I can say is that is one of the best waterfall swimming experiences I have had. Regarding to our trip, the Kaniungan islads are our real attempt to the sea. There are two islands, Kaniungan Besar (the bigger Kaniugan island) and Kaniungan Kecil (the smaller Kaniungan island). Kaniungan Besar is more touristic one. You can find some water sport attractions at the beach asides with the snorkeling activity that you can do easily by swimming not to far from the beach line. There are an accommodation service too at this island for any holiday makers who want to stay there. Snorkeling around Kaniungan Besar island. Situated Near Kaniungan Besar, the smaller island Kaniungan Kecil is an uninhabited islands with its pristine beach. Some people usually visit the island for camping, while others are just like us, made a short visit only for snorkeling. Under the surface of Kaniungan Kecil island. The last but not the least, we visited Labuan Cermin on the next day. People usually know Labuan Cermin first instead of Biduk-biduk because of its beauty panoramic view of its lake. A motor boat will take you to a 15 minute trip from Labuan Cermin port at Biduk-biduk to the lake. I will tell more story about this lake on another post. The beauty and every experiences we had at Biduk-biduk have successfully stole my heart. Not only the places, but also the people we met in Biduk-biduk. 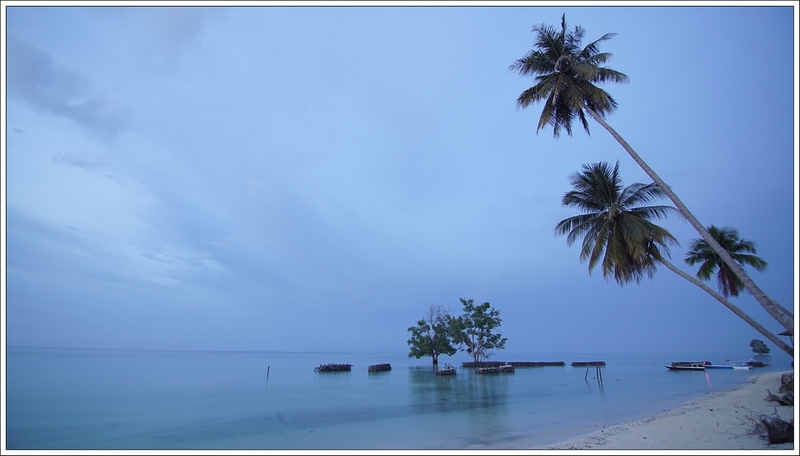 You can reach Biduk-biduk by flying to Balikpapan first and continue the trip by plane to Tanjung Redeb in Berau. The flight cost me Rp. 2,800,000 for Garuda Indonesia return ticket. After that, you have to rent a travel car (with other people who want to go to Biduk-biduk) and take a six-hour trip. We stayed at Losmen Miranti homestay at Biduk-biduk. 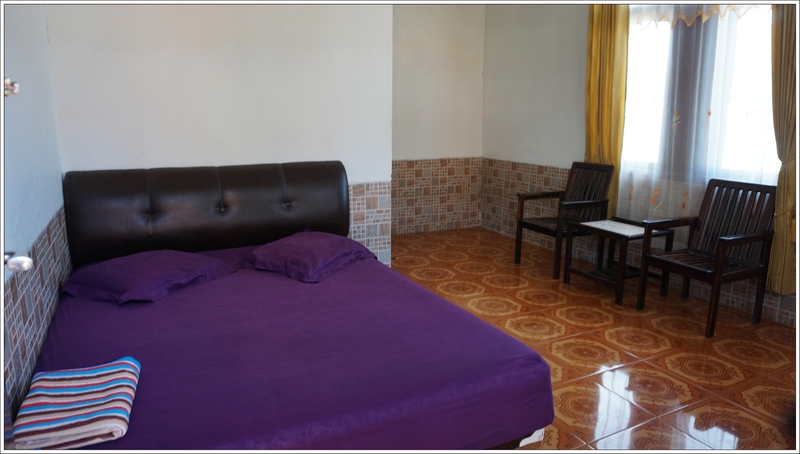 It is not the fancy accommodation but it offers the best beach line a hostel has in the area. We rented a room by the beach with television and air conditioner. It costs Rp. 250,000 per night, included breakfast. The owner even let us (and other customer) to use her motorcycle to get around the village. There is a small restaurant next to Losmen Miranti. So you would not worry about your meals during your stay. Call Ibu Hartuti if you want to book a room and stay at Miranti. Jl. Majahaba RT 04, Biduk-Biduk, Berau Regency, East Kalimantan. The electricity at Biduk-biduk only available from 06.00p.m to 06.00a.m. So, make sure you charge your phone, camera and other electronic stuffs at night. The boat to Kaniungan islands cost starts from Rp. 750,000 for a boat which can accommodate up to 10 persons inside. The boat to Labuan Cermin cost is Rp. 100,000 for a boat which can accommodate up to 10 persons. PS: I really want to send the postcard from Biduk-biduk, but I did not find any post office during my trip. Tapi perjalanan panjangnya menyenangkan kak.. Apa lagi kalo siang2.. This entry was posted on August 10, 2017 by Edna Tarigan in Beach, East Kalimantan, Indonesia, Nature, Tips, Travel, waterfall and tagged air terjun teluk sumbang, berau, biduk-biduk, borneo, east borneo, Indonesia, kalimantan, kalimantan timur, labuan cermin, labuan cermin lake, lake, landscape, teluk sumbang, teluk sumbang waterfall, travel photography.